The old adage about a picture being worth a thousand words is validated often with charts and graphs made for science, engineering, and finance. 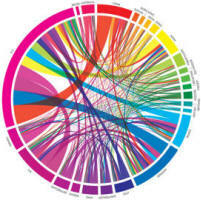 This chart illustrates levels of collaboration between 25 countries on scientific papers published in 2011 in a select group of journals. Author John Sexton uses color and line width to indicate origin and volume between countries. Circumferential length (pie slice) is relative volume overall. He also includes a similar chart showing internal collaboration within the 10 countries with the highest scientific paper output. Per Mr. Sexton, in 1996 about 25% of scientific articles were authored by people in two or more countries; today it is 35%. Non-commercial "Big Science" projects like the Large Hadron Collider (LHC) at CERN, with multinational funding, contribute largely to the increase. Aptly pointed out is how global access to and distribution of information has vastly accelerated the rate of invention and productivity. Sovereignty is still necessary to safeguard defense and financial competitiveness, but it should not restrict collaboration between willing participants otherwise. Even self-identified "no borders" people tend to safeguard their own interests by constructing social, political, and economic boundaries around their work. That goes for collaborators as well as for individual researchers. When it comes to themselves, being an "idea capitalist," as Sexton puts it, is OK, but everybody else should openly share. Another statistic mentioned is that the United States' dominance in patents issued by the U.S. Patent and Trademark Office (USPTO) ended in 2008. As manufacturing and research continues to move offshore, so does the origin of invention. A country's status in the world is based on a lot of things, among the top of which is scientific contribution. Money follows invention, as is evidenced by venture capital on a corporate scale and the relatively new crowdsourcing phenomenom on a personal scale. America's slice of the pie is contracting, much to the delight of many people, including, unfortunately, many of our own citizens. Our schools are droppping in global rankings, productivity levels are decreasing, and our dollar is being devalued by unfettered monitization (electronic and physical printing). Aforementioned politicians and uninvested layment seem bent through both malice and ignorance on knocking the U.S. off its pedestal. We're teetering now; will we continue to sleep and be toppled, or will we finally wake up and restore the once-great leadership role we once had? BTW, there is also a good article titled, "Why Germany Still Makes Things" worth reading. Unfortunately, a subscription is needed to read the entire article, but you can get a copy from your local library. Of course you can always subscribe to Scientific American; I look forward to my copy each month. If you read a couple of the comments posted by readers, some lament the loss of depth of the articles compared to when they first started reading decades ago. The irony is that obviously their depth of knowledge has increased, not necessarily that the magazine's content has decreased. That is the case with me as well since when I began reading Scientific American back in the late 1970s, the concept of quarks, quantum mechanics, astrophysics, genetics, biology, psychology, and many other realms of study was completely new and I was mesmerized by the data begin presented. Today, I am no expert in any of the fields but I do find some of the material does not have quite the "wow" factor as before. However, there is always something new and worth reading.